Japan has few domestic energy resources, and imports significant quantities of coal, crude oil, and liquefied natural gas. 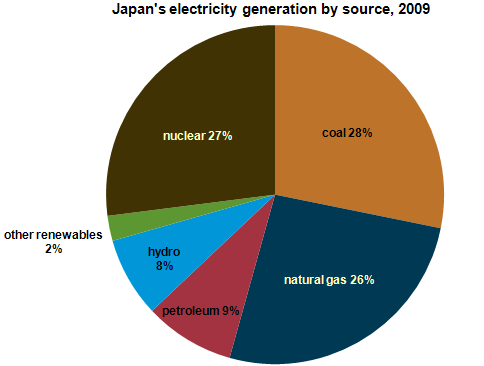 In 2009, Japan produced 27% of its electricity from nuclear power. From 2000 to 2009, the contribution of nuclear power to Japanese electricity generation varied between 23% and 31%. In the United States, the contribution of nuclear power to electricity production is more stable at 19% to 20%. Of Japan's total 2009 electric power generation, 63% came from conventional thermal sources like coal and natural gas, 27% from nuclear, 8% from hydro, and 2% from other renewables. Japan is the third largest consumer of nuclear power in the world, after the United States and France. In 2008, Japan had 280 gigawatts (GW) of total installed electricity generating capacity, the third largest in the world behind the United States and China. Before the earthquake and tsunami on March 11, 2011, Japan had 54 operating nuclear reactors with a total installed generating capacity of around 49 GW. The Japanese government planned to increase nuclear's share of total electricity generation from 27% in 2009 to 40% by 2017 and to 50% by 2030. Although Japan accounts for the most electricity consumption in Asia, it has one of the lowest electricity demand growth rates in the region, projected at an annual average of 0.7% from 2007 through 2018 by the Federation of Electric Power Companies of Japan. For more information on Japan's energy use, please see EIA's Country Analysis Brief on Japan.